I rarely ever take cake orders in the summer, not since the cake fiasco of 2015. On a hot summer day, I made a two-tiered cake with an assortment of fondant animals that took hours to create. It was too large to refrigerate so we had it sitting at room temperature until it was ready to be delivered. Right when we were about to move it, there was a strange buckling around the edge of the cake. We kept calm and moved it to the car, which even after having the AC on for 30 minutes was not cool, but warm. During the 30-minute ride to our destination, the buckling worsened and the fondant pieces started to warp with the frosting. By the time we got there, the cake looked like the Michelin Man’s arm. It sucked that all my hours of work went down the drain, but it was even worse that I ruined someone’s event. That’s the thing about cakes; they are usually the centerpieces of celebrations and can make or break a party. Since then, I’ve turned down any requests for a cake in the summer. Not because I didn’t want to do it, but more so because I was worried about ruining someone else’s big day. When my sister approached me about making a cake, my gut reaction was, “No.” After hearing my reasons, she said that it didn’t matter if the cake was perfect and that her friends were just grateful that I would do it. Knowing that perfection wasn’t what they were after took a load off my back, but that didn’t mean that I would try any less. 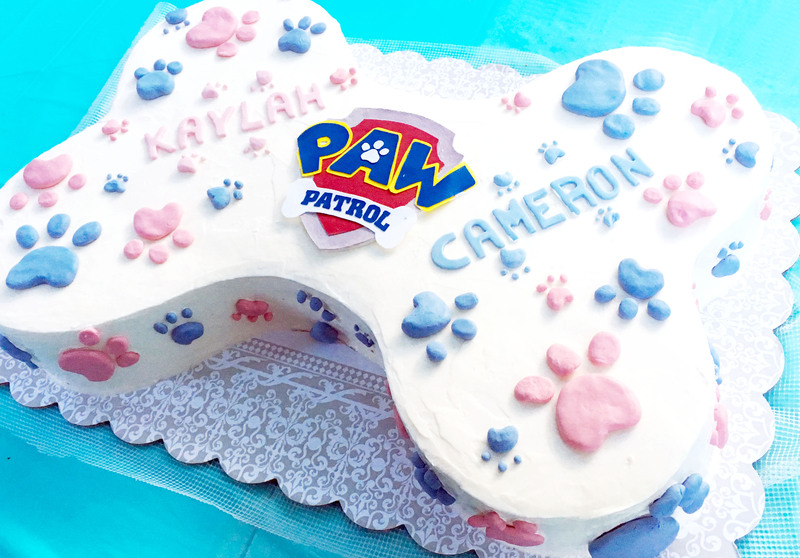 There is a very popular Pinterest picture of a dog bone shaped Paw Patrol cake (this was the photo I was asked to recreate), but it has no information on the dimensions and how to put it together. And after scouring the internet for information, I decided to make a guide on how to put a cake like this together. Like many of my projects, it is not very difficult, but it is time consuming. I think the overall effect is worth it and even more worth it to see the smiles on kids’ faces. Instead of using fondant for all of the Paw Patrol logo, I used Wilton’s sugar sheets. It is much more stable for hot and humid weather and it’s great for crisp edges. It is important to have a fresh Xacto knife blade. You want the edges to be super crisp. Almost like you printed the logo onto the cake. I did make a fondant base for the logo so that the logo would not be flat against the cake like paper. Other than that, it’s making a lot of paw prints, which looks simple but it ends up taking more time than anticipated because for every paw print there are 4 parts to be made. This cake has approximately 50 paw prints. The most difficult part about the cake part is covering the cake with frosting. There are many circles and lines and it took a while to get the crisp edges. But then again, it might be because I’m a novice at frosting untraditional cake shapes. I’m not complaining, it’s always fun to stretch beyond my comfort zone and try new things. Cut out the yellow border of the “PAW” from the paw patrol logo. 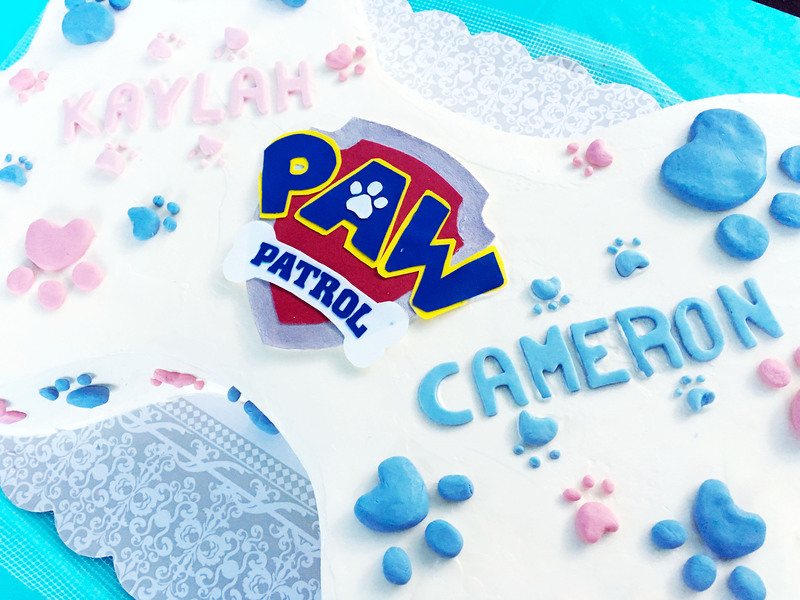 Place the “PAW” letters on top of a blue sugar sheet and cut out a piece of the sugar sheet large enough for the letters. Peel off the plastic backing. Cut out the “PAW” with the xacto knife. Cut out the white paw in the middle of the “A” from the paw patrol logo. Place the paw print on top of a white sugar sheet and cut out a piece of the sugar sheet large enough for the paw print. Peel off the plastic backing. Cut out the paw print with the xacto knife. Cut out the white bone from the paw patrol logo. Place the bone on top of a white sugar sheet and cut out a piece of the sugar sheet large enough for the bone. Peel off the plastic backing. Cut out the bone with the xacto knife. Place the bone on top of a blue sugar sheet and cut out a piece of the sugar sheet large enough for the bone. Peel off the plastic backing. Cut out the “PATROL” letters with the xacto knife. Cut all the 6-inch cake layers in half. Cut one of the halves into quarters. Cut a 2 inch strip from both of the 9×13 cake layers. You want to cut the width side of the cake (the long side, not the short side). You will be left with two 7×13 cake layers. Spread a generous layer of the chocolate frosting. Let the cake set in the freezer for about 10 minutes. Remove the cake from the freezer and spread one layer of the vanilla frosting. Trying to cover up the chocolate as well as you can. Let the cake set in freezer for about 10 minutes. Preheat the oven to 350°F. Prepare one 9×13 baking pan and three 6-inch round cake pans for baking by spraying them with nonstick spray and lining the bottom with parchment paper. In the bowl of a standing mixer fitted with the paddle attachment, mix the flour, sugar, baking powder and kosher salt on low speed. Add in the butter and 1 ¼ c. buttermilk into the flour mixture on low speed. Scrape down the side of the bowl. In a large cup with a spout, mix the eggs, egg yolks, ⅓ buttermilk and vanilla extract with a whisk. Slowly add the egg mixture into the flour mixture. Scrape down the side of the bowl and mix on low speed again until well combined. Divide the batter evenly amongst the four pans, making sure that the three 6-in pans are even. Bake about 15-20 minutes until cake is golden brown or a toothpick inserted comes out clean. The 6-inch cake pans and the 9×13 pan will have different cook times. Make sure you check both to make sure one doesn’t overbake. Place all the ingredients in the food processor and pulse a few times before processing it until the frosting is smooth. Put the whole bowl in the freezer until the frosting sets. Similar to a ganache, the frosting will become more firm and easier to handle after about 10-15 minutes in the freezer. Bring a small pot filled with about an inch of water to a simmer. In a bowl of a standing mixer, whisk the egg whites, sugar, and salt together. Place the bowl on top of the pot and whisk continuously until the mixture becomes slightly foamy and you cannot feel the grittiness of the sugar, about 5-8 minutes. The mixture will be hot. Be careful. Move the bowl to the standing mixer fitted with the whisk attachment and whip the egg mixture until the bowl feels cool to the touch. Add in the butter, and continue to whip until a smooth buttercream forms. Add in the vanilla extract and continue to whip until incorporated. Cake and chocolate frosting adapted from sweetapolita. Swiss meringue frosting adapted from the smitten kitchen. This entry was posted in Birthdays, Cakes, Chocolate, Desserts, Holidays, Vanilla and tagged birthday, Cake, cakes, chocolate, Desserts, Holiday, nickelodeon, paw patrol, vanilla. Bookmark the permalink. Cake looks great! I am also an amateur cake baker who is asked to make cake for people. I mostly just do it for my family. Someone has asked me to make this cake and wanted to know what I would charge. How do you go about charging for a cake? Can you make a smaller version of this cake?? And approx how much did it cost you to make? Hi, Carmen. I think a smaller cake can be made by using 4″ cake pans for the corners and just one 9×13″ rectangle cut in half and stacked. As for the cost of the cake, I did it as a gift so I didn’t keep track. But if I had to approximate the size of the cake and the hours of work it took, I would probably charge around $150. I hope this was helpful! Can you use buttercream icing instead of the vanilla swiss merinque? What are the conversions from grams to cups for the cake flour and sugar? Nicole, it would be 3 3/4 c. flour and 2 1/2 c. sugar. I hope this helps! and 500 g = 2 1/2 c sugar…… if 450 g is 3 3/4 c flour, shouldn’t 500 g be more than 2 1/2 cups sugar?, …since 500 is a higher measurement than 450? Not trying to be smart-like, just want to make sure i get it right! Excited to try this! No, because a cup of flour weighs 120 g and a cup of sugar weighs 200 g. Hope this clarifies your confusion. what temperature do you bake the cake? Do you know approximately how many servings the cake was? I would say it would feed at least 30 adults easily, and if the cake was cut into “wedding cake” slices, it could stretch to feed 50, that is if everyone had just a sliver. I need one for 50 servings…. Torilynn, the cake fit a 14 in. x 20 in. cake board perfectly. I would say the cake was about 5-6 inches tall. Hope this helps! Help! I did the conversion for sugar which was shown as 500 grams….that is almost 4 cups! Hi hen I read in your response to conversion from gr to cups that it was 2.5 cups I just baked the second layer. Please tell me it will be ok. Thanks for getting back to me.i threw it out and am about to start again with the right info. I looked up conversion from gram to ounces, rather than to cups. My bad..expensive lesson. What kind of paper did you print the logo on and how large did you print it? Hi, Rosa. I didn’t print the logo at all, I cut out each piece with Wilton’s sugar sheets. The details on how I put it together is written above. I plan to make this cake on Saturday night to serve on Sunday afternoon, do you have any storage suggestions? Hi, Rosa. I would suggest refrigerating the already frosted cake on Saturday and putting the fondant decorations on it on Sunday. Do NOT refrigerate any fondant decorations because they will get sticky and condensation will form and possibly melt. I would suggest making the fondant decorations on Saturday, but not placing it onto the cake until Sunday. It is time consuming to make the decorations and I figure you would be short on time on Sunday. Hope this helps! Feel free to tag me on instagram @thebusyspatula and share your project with me. 🙂 I’d love to see the end product! Thanks! I will definitely share. I’m excited to make this. How did you get the rounded center? Did you cut an extra piece that you didn’t mention in your instructions? Thanks! I’m not sure what you mean by the rounded center. Can you clarify? 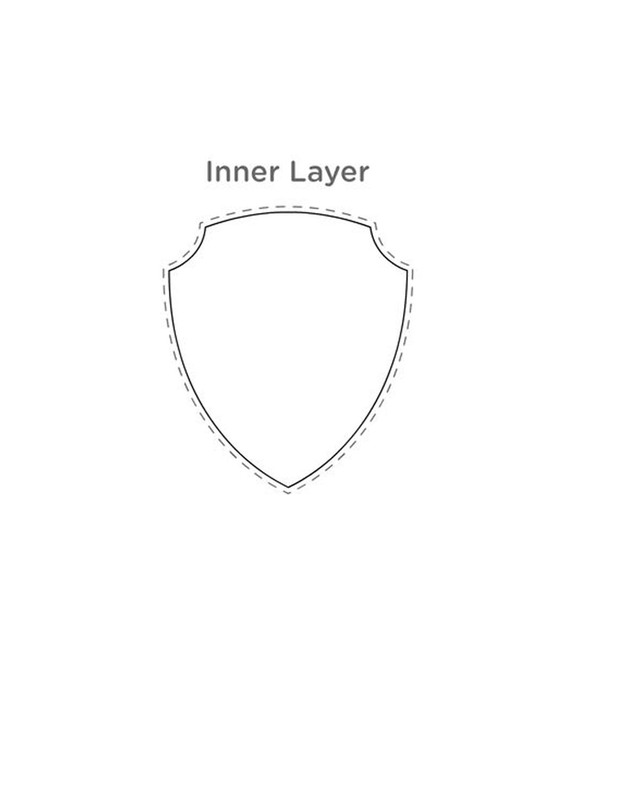 # I never did figure out why the instructions say to cut one of the 6-inch layer halves in half? # Also, I never figured out why the cake was originally frosted w/ a (seemingly — from the photos — very) thin layer of chocolate frosting? # I also lined each pan with parchment paper to make them easy to release from the pans. # My source for converting grams to cups said 450 grams of flour/sugar is 2.25 cups, and 500 grams of sugar is 2.5 cups, so that’s what I used in the cake batter. My cake was very dense — kind of like a sponge/pound cake. Was easy to work with, but am wondering if that’s the texture your recipe intends or if my “grams to cups” conversion maybe gave me a different result? # I made the entire recipe “dairy-free” as my granddaughter is allergic to dairy. I used almond milk instead of buttermilk and “Melt” as a butter substitute. 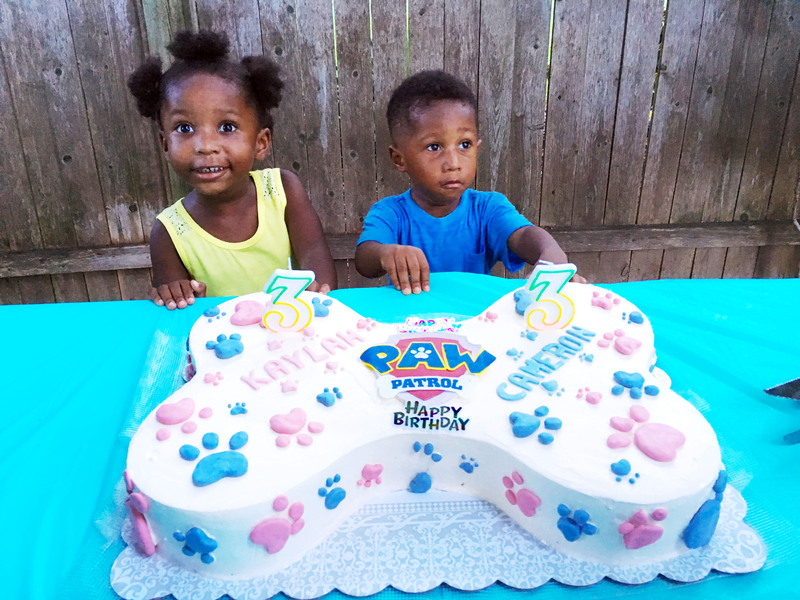 # I ordered an edible, pre-made Paw Patrol decal for the top of the cake. Worked great. Molly, I’m so glad the cake turned out well! You are correct that 500 g. of sugar is 2.5 cups. I would say that the texture of your cake was more dense because of the dairy substitutions. The cake, when baked with diary, is slightly dense but also moist and not pound cake like. I used two batches of the recipe that I put. 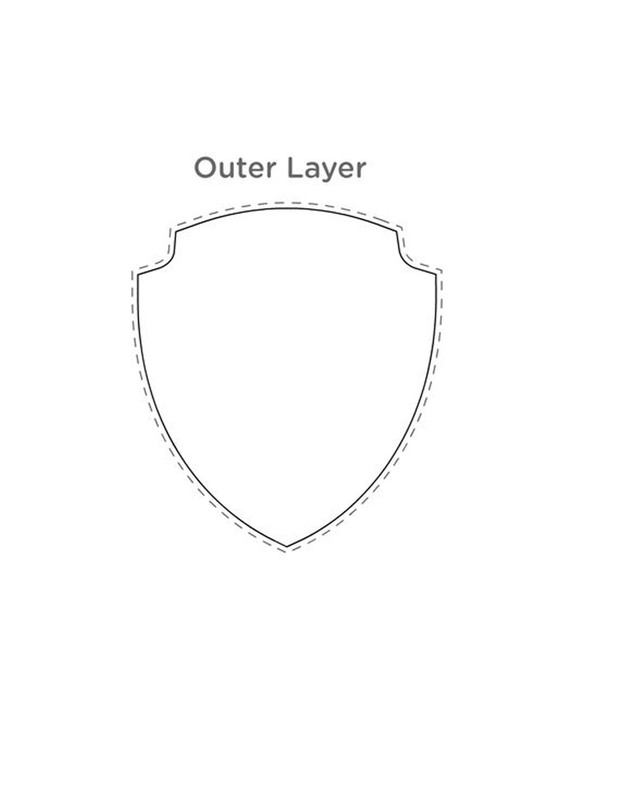 “This will make three 6-inch round layers and one 9×13 layer. You will need TWO batches of this.” In total, you would have six 6″ rounds and four 9×13 cakes. The instructions say to cut the 6″ rounds in half because it makes it easier to make even quarter cuts for the corners of the dog bone. You can certainly just cut a quarter out of each 6″ circle without cutting it in half. It just makes it more even overall.